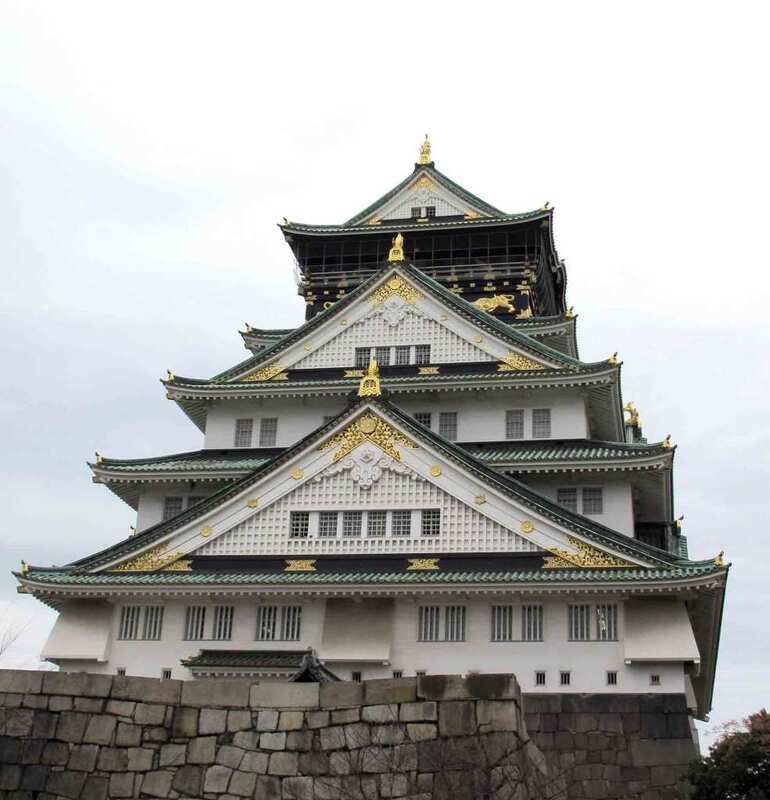 There’s so much to see in Japan that choosing where to go if you only have a limited amount of time can be a bit overwhelming, but in my humble opinion it is definitely worth spending a bit of time (and stomach space) in Japan’s second city, Osaka. 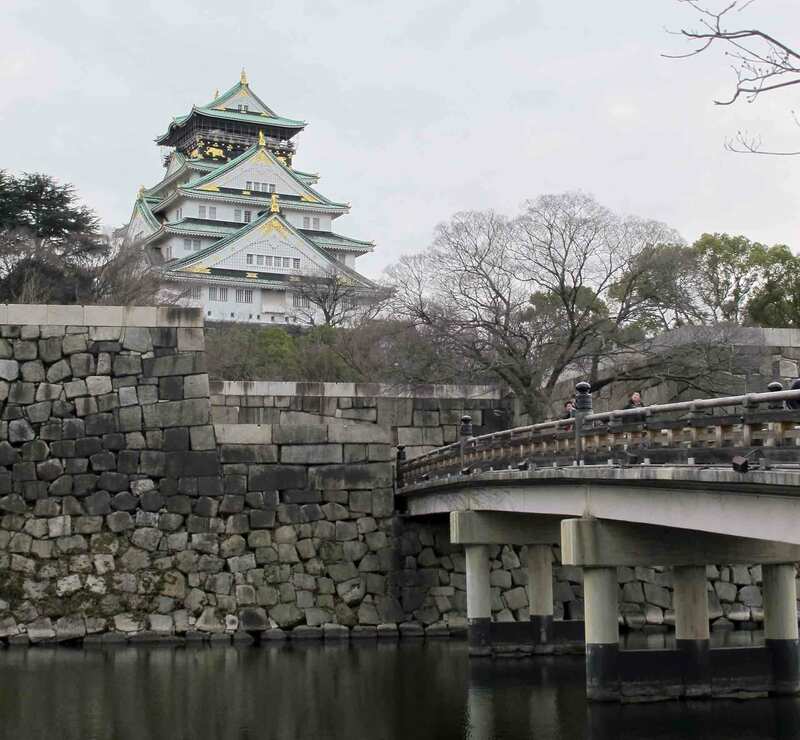 There aren’t as many big attractions for tourists in Osaka as some of Japan’s cities, but if you’re in town make sure that you find the time to visit Osaka castle – one of the finest in Japan. 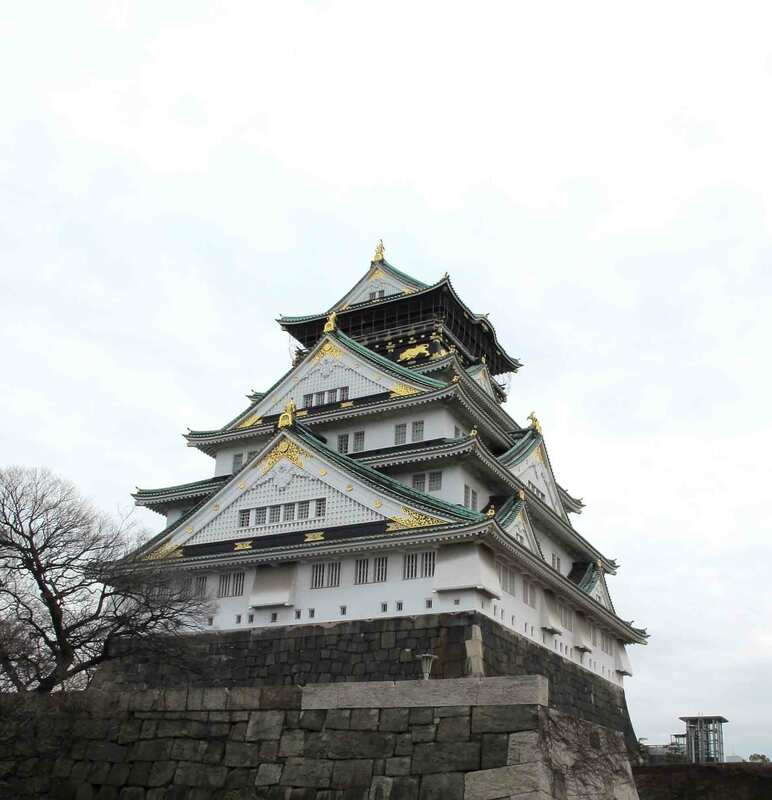 The imposing castle is one of Japan’s tallest (the main tower stands at 55m tall) and towers over the city. You get a great view out over the city from the top so it is worth climbing all the stairs! The castle underwent major restoration in the 1990s so the ornamental gold details shine out (the tiger reliefs and the gold fish tails are particularly fine). These ornate features really distinguish the castle from others I’ve seen in Japan so far. 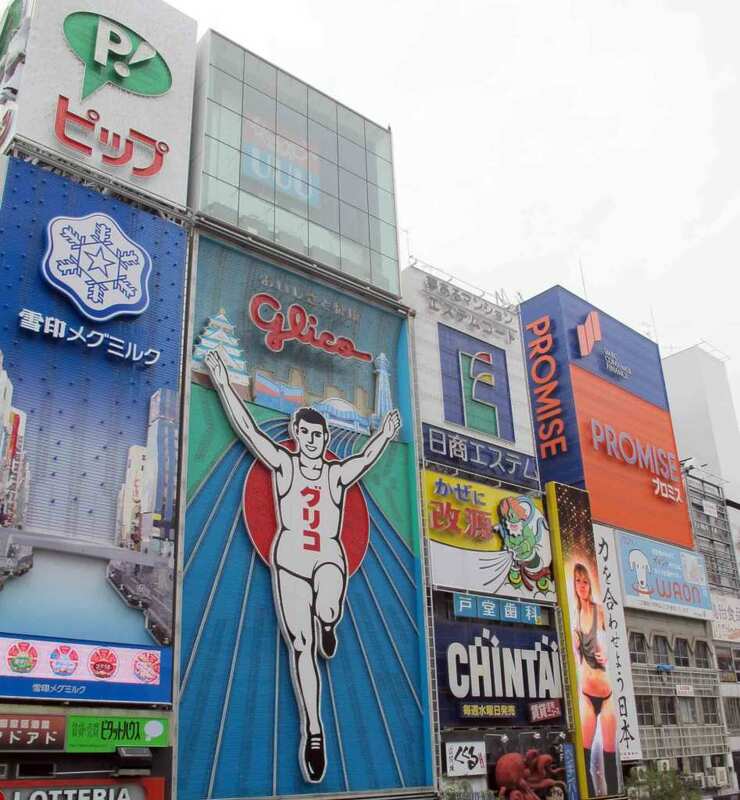 From the traditional to the modern – another of Osaka’s big attractions is the Glico Man. This neon sign, one of the many in the area, is famous because it has been in place since 1935 and although it has been altered for special events over the years remains a constant and very recognisable feature. 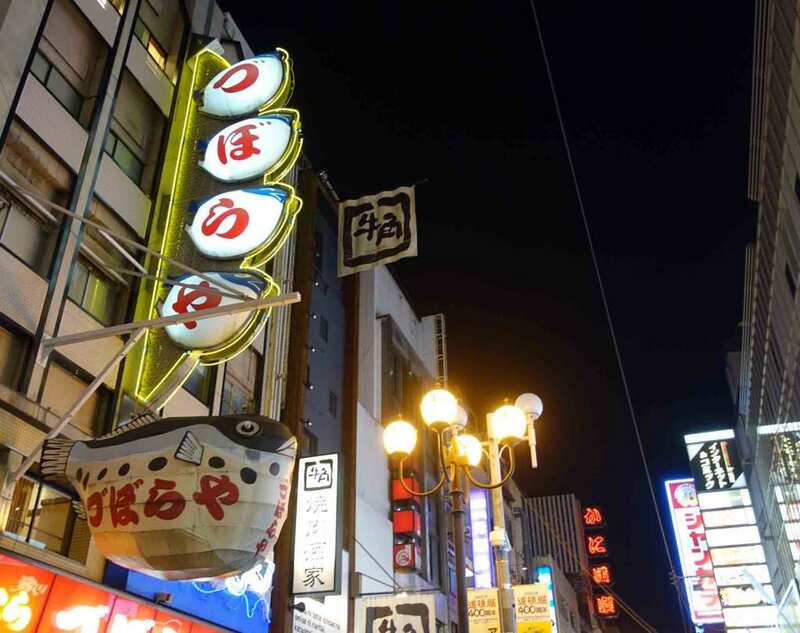 And the neon lights of Dōtonbori shine out. 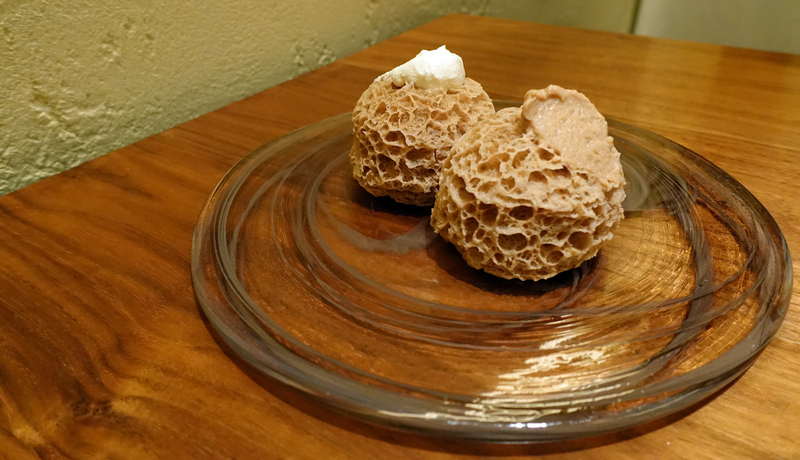 While the sights of Osaka might not run you ragged, the food scene (both fine dining and casual eats) leaves you spoilt for choice. 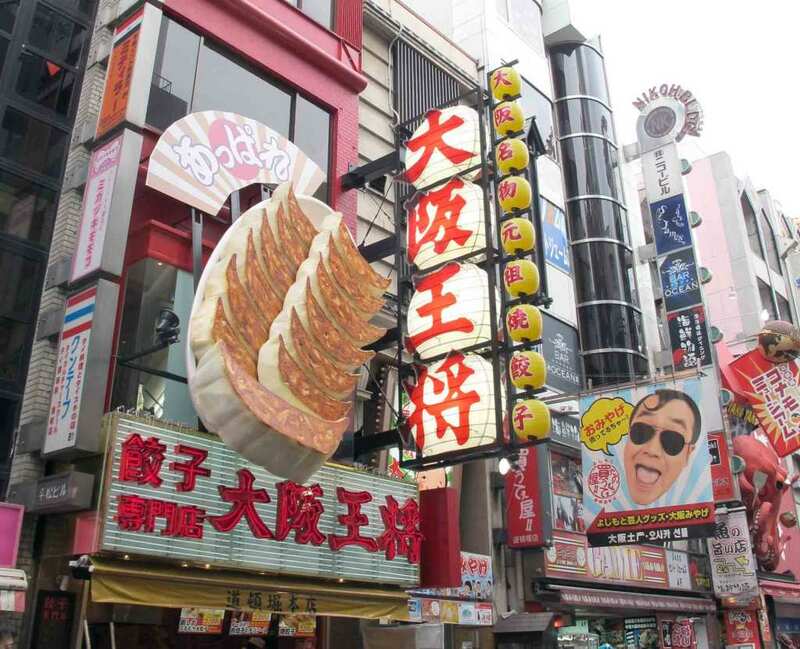 Dōtonbori offers loads of different cheap, but delicious options. 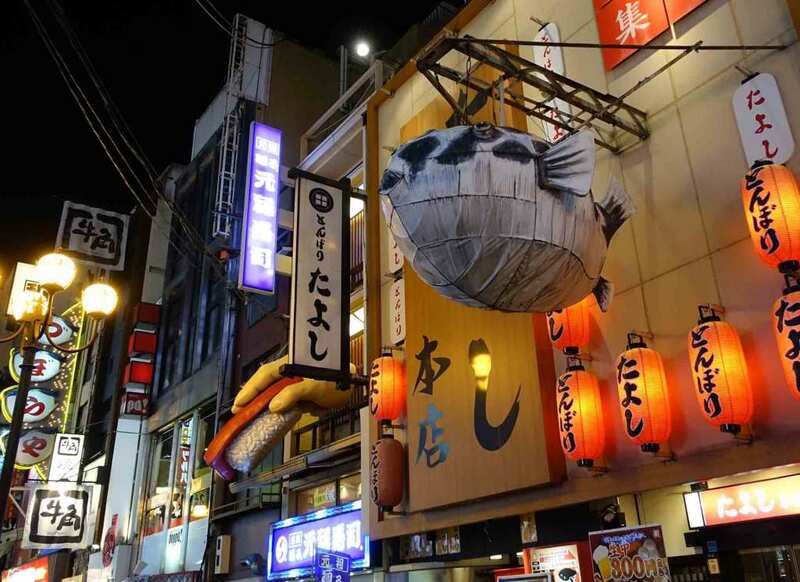 And for those that worry about their lack of Japanese, there is really no need…the speciality of each different restaurant is handily advertised by the larger than life facades. Particularly famous examples include the huge fugu lantern of Zuboru-ya restaurant (seen above) and the six and a half meter mechanical crab of Kani Doraku Crab restaurant which really is a sight to behold. 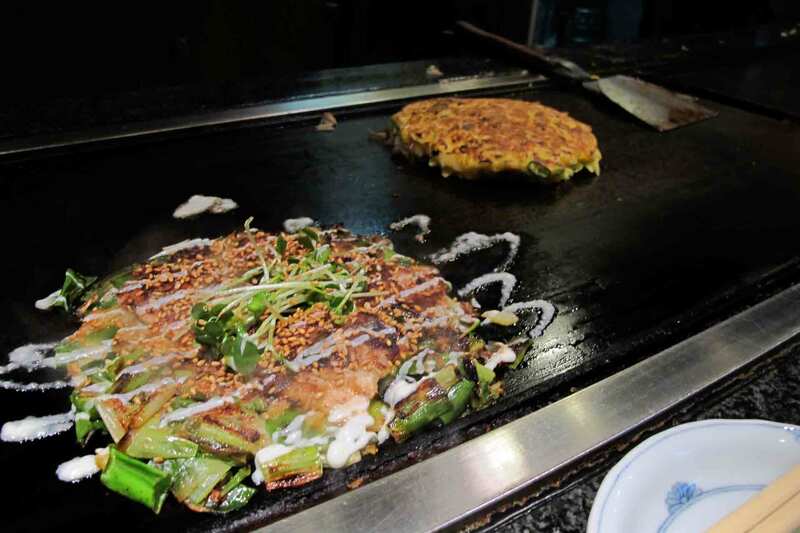 Okonomiyaki known as Osaka’s soul food is a must try – it is a difficult dish to describe as it comes in many permutations but it is essentially a mixture of cabbage, batter and whatever meat or fish is available and comes to resemble a pancake. Not convinced?! Trust me, this is one delicious, hot mess. The smothering of Japanese mayonnaise and a thick, sweet version of brown sauce add so much flavour and despite it being described as a snack you come away very satisfied. 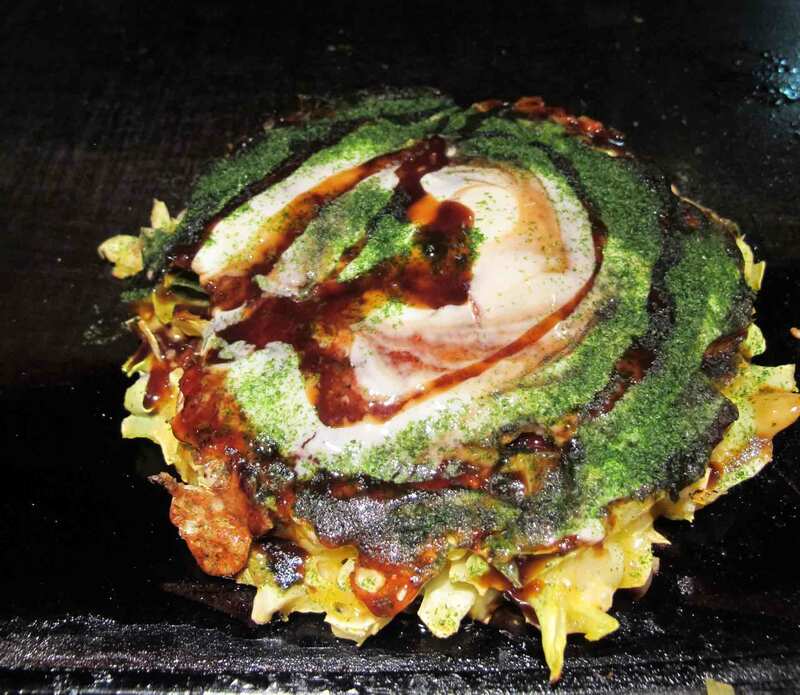 My favourite okonomiyaki restaurant in Osaka is Mizuno (at 1-4-15, Dotonburi, Chuo-ku, Osaka, 542-0071) which opened its doors back in 1945 – and I think its safe to say they’ve mastered the art of a seriously tasty cabbage pancake! If you’re willing to stray out of the centre of town then it is really worth heading out to the Fukushima district to try the yakitori restaurant Ayumura (5-17-39, Fukushima, Fukushima-ku, Osaka-shi, Osaka, 553-0003). Be warned, however, that as well as straying outside of the the main drag you will also, in all likelihood, be straying out of your comfort zone – there is not an English menu in sight so you could get any (and I mean any) part of the chicken on your stick. That said, everything we tried was delicious (and clearly others have agreed as the restaurant is the only yakitori joint in Osaka to have been awarded a Michelin star). Like most of Japan’s big cities, Osaka boasts amazing shopping and a plethora of nice hotels to stay in. 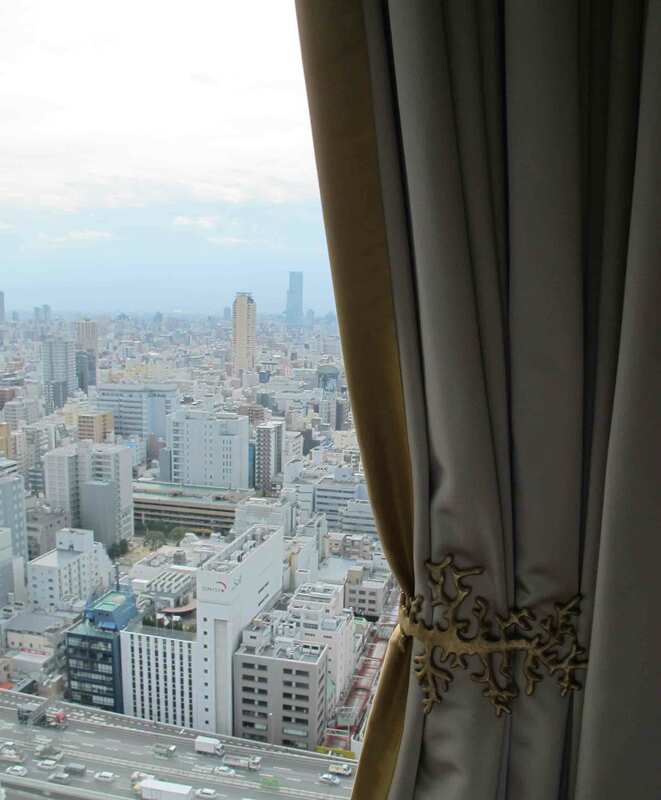 I have to recommend the St Regis Osaka, which we have stayed in on both of our trips to the city. 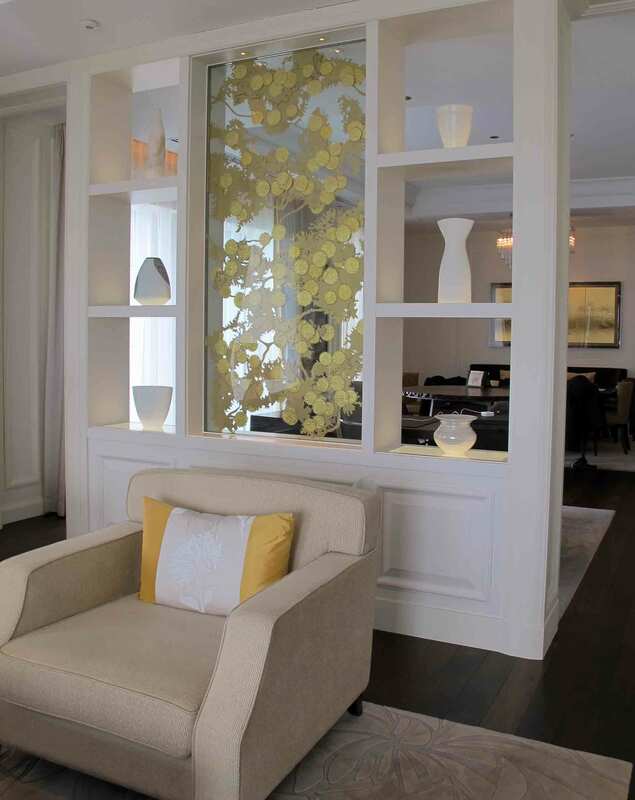 The staff are very kind and helpful, there is a great gym and a delightful spa. And if you’re not there to be virtuous then the bar (with its incredible mural of Osaka) is not to missed. We were unbelievably lucky the first time we stayed and got bumped up to the Royal Suite – definitely one of the most luxurious hotel rooms I have ever stayed in. 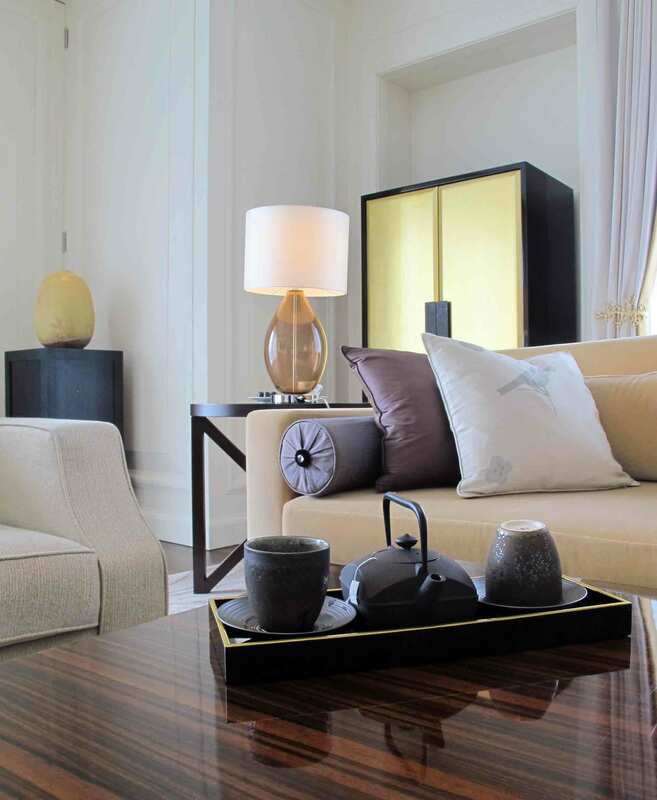 Every detail of the study, living room, bedroom and bathroom had been meticulously designed and the overall result was one of sumptuous luxury but in an incredibly subtle, beautiful manner. 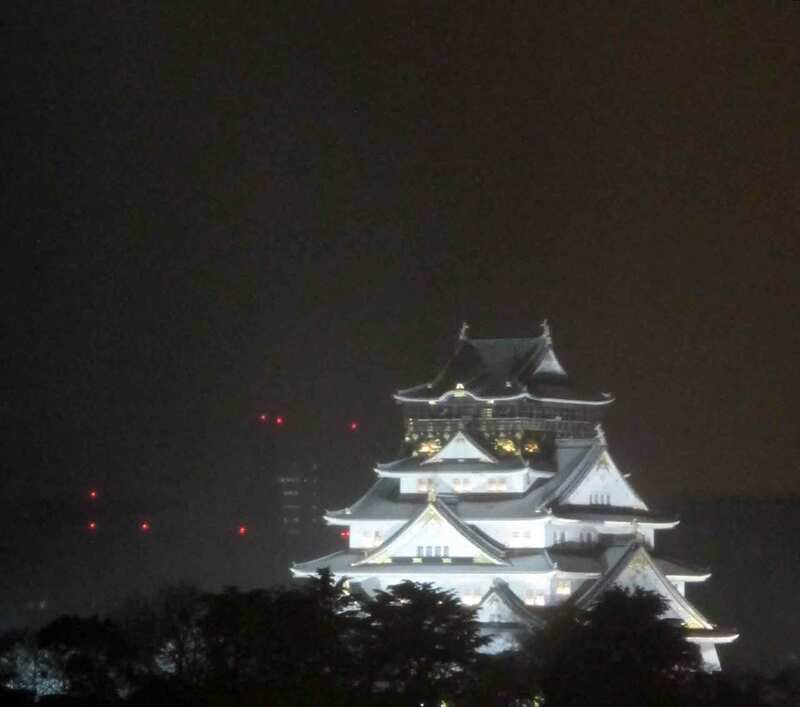 If you’re short on time and sightseeing is top of your itinerary then Osaka in itself may not be enough to draw you in but given it is only 15 minutes on the shinkansen from the major sights of Kyoto (and in all likelihood you will have the advantage of unlimited travel with the railpass) I would really recommend considering spending at least a night in Osaka to sample its culinary delights and check out its bright lights. 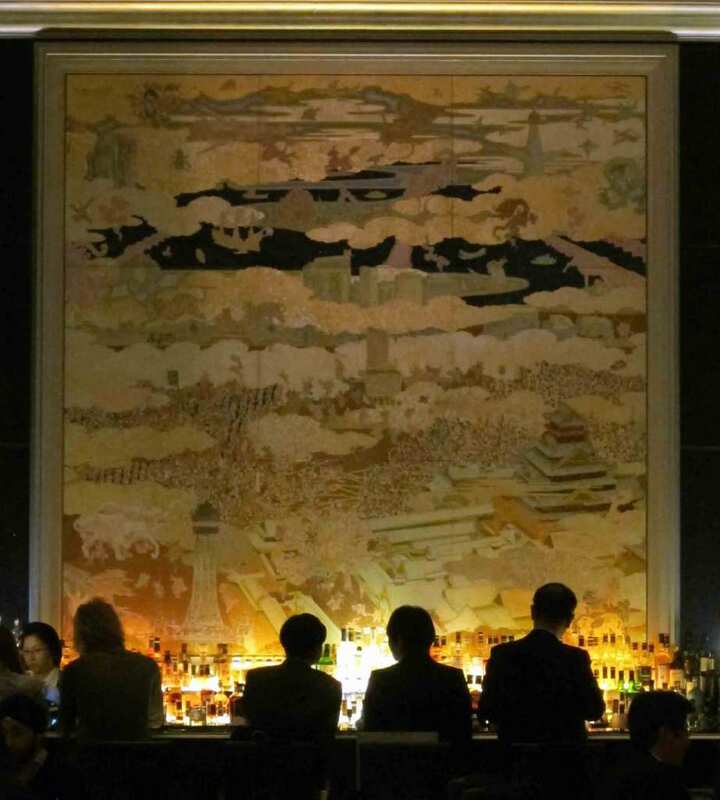 This entry was posted in eat, explore and tagged Castle, city break, city lights, Flashback Friday, Japan, Osaka, St Regis. Bookmark the permalink. Such a beautiful city and what a dream view!